To kick off our Book Corner section of the site, we bring you A Journey Through Portuguese Football, the most in-depth English-language book ever written on Portuguese football, penned by members of the PortuGOAL.net team and some very special guest authors. For a detailed description of the book, the introduction is reproduced below. Answer the question at the bottom of the page to be in with a chance of winning the book. We are giving away three copies to the competition winners. In the last twelve years Portuguese club sides have provided six finalists in European competitions. In the same period the national team has qualified for every World Cup and European Championship, reaching four semi-finals and one final. Europe’s major football teams constantly feature key Portuguese players. The world’s most successful coach hails from the country. And yet Portuguese football continues to be criminally underrepresented in the international sporting press, especially English-language media outlets. This book aims to redress the balance. “A Journey Through Portuguese Football” is just that. Although framed around a detailed month-by-month description of the 2012/13 campaign – one of the most exciting seasons in living memory – the book contains much more. Some of the sharpest football minds out there have turned their attention to in-depth analysis of the beautiful game in Portugal. Michael Cox, of ZonalMarking fame, gives a brilliantly argued explanation of why Portuguese football in general, and Portuguese coaching in particular, is consistently ahead of the game. BBC journalists Andy Brassell and James Horncastle help explain the intricacies of the game in Portugal. As well as an expert view from without, the book also contains a detailed analysis from within. Three of Portugal’s top football journalists, Luís Freitas Lobo, Luís Sobral and Rui Catalão answer three challenging questions, giving a unique insight into Portuguese football from those who know it best. Exclusive interviews, Portuguese football expressions in cartoon form, a section dedicated to supporters’ opinions are also part of the fare, interspersed with a vivid depiction of a wonderful season of football, culminating in a quite breathtaking climax. 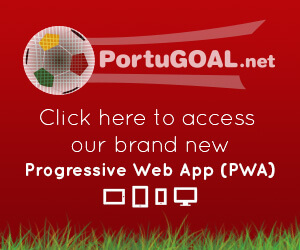 The title race, the cups, Europe, the Seleção – it’s all covered by the PortuGOAL.net team. 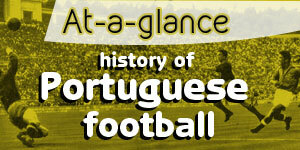 A Journey through Portuguese Football. Putting Portuguese football on the pedestal it deserves. 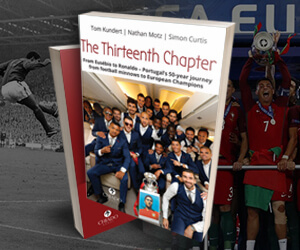 A considerable proportion of the book is focused on the 2012/13 season, which threw up one of the most thrilling title races in the history of the game in Portugal. How many Primeira Liga games did Porto and Benfica lose in 2012/13? Update (27/10/2014): Congratulations to the three competition winners, Daniel Figueiredo (USA), Denny Pereira (Canada) and Paul Sousa (USA), who along with dozens of others were correct in answering that FC Porto lost zero games and Benfica lost one game in the Primeira Liga in 2012/13. A copy of the book is on its way to them. Thank you to everybody for entering! 1) It can be ordered from Amazon by clicking here.